For you guys (@acmx for one) who just went into M5, well after Nationals 2018 you'll be going back to M4. That is if I read the rule change correctly. This would put you back in M4 for the 2019 season and then back to M5 for the next season. Doesn't this have to be approved by the AWSA Board of Directors before it's final? The Rules Committee recommends approval so it likely will happen. Or has the Board already approved? Some common sense adjustments. Good. I was for these rule changes until I found out that @eleeski was for them. Since I disagree with everything Eric says I am totally opposed to these rule changes. Everybody go ahead and send angry emails to Richelle. I would assume that when Richelle finds out that Eric supports these rule changes she will also be against them. What’s the reason for having a tournament supplied handle? @Mateo Vargas I forget my handle all the time. Oops. @Mateo Vargas rarely used anymore. There was a time when not everyone brought their own handle. Kind of an anachronism, but rules do have to account for it. @Horton emphasized in bold that the changes were proposed. I suppose that they were only approved by the Rules Committee, and like @dbutcher said they will have to go before the BoD, but that will undoubtedly happen. These are rules change proposals. Due to several requests the rules committee has made these available before December 1st so that folks can read, digest and comment on the proposed rule changes BEFORE the board votes on them in January. While comments, questions and suggestions are welcome here, if you want your opinion heard you MUST reach out to your AWSA National Directors for your region before the board meeting. While BOS is a great resource and communication tool for waterskiing do NOT expect your opinion to be heard just because you posted in this or any other thread. If you are an AWSA member and need help determining who your director is or how to reach them, please PM me. Another proposal, 4.02C2 strangely enough, values scores achieved at Class C higher for rating purposes than those achieved at E or L??? This is what we wanted concerning rule changes. NOTIFICATION. And time to contact our representatives. Let your voice be heard. I am very excited to see the mini course option in the proposed new rules. I hope this passes and that tournament organizers give it a shot. Could make a big difference in getting kids and beginners into the sport and keeping them in. I agree with @jcamp on the mini course. My daughter pretty much dropped out when we migrated to AWSA tournaments because she wasn’t comfortable running the full course. I think I could have kept her interested in tournaments until she got comfortable on the full course with the mini course. Unfortunately she is 19 now and that ship has sailed. @jcamp I expect that rule to pass. Anticipating the rule of unanticipated consequences... what happens when a Girls 1 has a total score of 2 1/2 buoys on the full-size course and is beaten on the rankings list by another girls 1 who runs 6 buoys in the mini course? @Chef23 There is still a chance with collegiate skiing. @LeonL I don't even have to look it up to tell you that you completely misunderstand the rule proposal. If I wasn't still in bed drinking coffee I would just give you a Panda. @Horton Yeah, I guess that's sorta a bummer, but I think the long-term benefit of getting kids more excited to participate in tournaments outweighs the short-term drawback of worrying about the ranking list scores of kids making less than a full pass. Plus, that girl who in the past could only get 2.5 buoys can now keep skiing and adding buoys to her score. Where the new Slalom division has a maximum speed slower than that of the original performance -- the buoy count score carried into the new di- vision will be reduced by 6 buoys if the score was achieved in a class E, L, or R tournament (10.06.C). Note its says "if the score was achieved in a class E,L, or R", leaving one to deduce that the alternative is a score from class C. Thus a score carried into the new division from class C is taken at face value, with no reduction. Now how did I completely misunderstand that? I can tell you that despite the fact that this is proposed and not in the current rules, my carry scores from M7 to M8 were taken at face value if class c and the L score was reduced by 6. Look at my scores on the ranking list and calculate for your self. My average looked weird and the only way to get the average showing was to figure the L at a 6 buoy reduction and the class C scores at face value. Prove me wrong and I'll gladly accept a Panda and offer a mea culpa. Florida will vote to secede from the Union over the Level 10 Rule. That's already in the works. @DaveLemons probably not so. If your wife skied W5 in the 2017 season that means that she will ski 2018 as a 54 year old and 2019 as a 55 years old. Seeing as how the rule doesn't take effect until after Nationals 2018 she won't be affected, she'll be W5 age by then. So, no worries. @LeonL I am willing to eat Panda pie is needed. I have read this rule a few times and don't know who should be eating Panda pie. I think I understand that L and above events adhere to IWWF rules so there is no overspeed ZBS. In that case the ball count would have to be depreciated. For USA water ski rankings, if the new rule kicks in as of Nationals it would only impact your 12 month rolling ranking but not your USAWS year ranking. Are we talking about a discrepancy that happens with the creation of a new division or are we talking about a discrepancy that happens when a skier ages out from one division to another? @LeonL PROPOSAL: 4.02C2 is merely conforming to the current ZBS rule, which states one can not ski above div max in E,L,R. So yes I guess one way to look at it is that a class C score is higher or more valuable but its not that its more valuable or higher it just that ZBS is allowed in C. What we discovered is that when a skier changes divisions, where there is a speed change, those scores achieved in the prior division at a speed that is now higher than his new division max speed should not count b/c technically one can not ski above div max in E,L,R. FYI, prior to ZBS, anyone who moved up a division that changed speeds would always loose 6 buoys on those scores, so the real change here is that now they do not loose 6 buoys on their scores if they were achieved in class C due to ZBS. Clear as mud. @jcamp glad you like the mini course, it should pass but the beef will be that its allowed in class C and being added to the rulebook. To that I say, we currently allow class F scores (i.e mulligans) all the way into shortline (level 5) so if we are OK with that I sure hope we would be ok with a max score of 5.5 via the mini course on rankings. Only 25% of the country host class F events so if we make it class F only then we are not embracing what the mini course can bring to the table for the grassroots end of our sport. Lets be inclusive not exclusive! I’m with @LeonL on his analysis. That’s how I read it too. ELR scores are discounted by six, but there is no discount applied to the C scores. To me, this makes no sense whatsoever. This could be a great year to go to Nationals. There is (or at least was) discussion about a boycott by some of the better Florida skiers, maybe more in support. @Jody_Seal ? @lpskier their logic in this is you can ski over speed and get credit in class C but not ELR. Thus you can't drag ELR scores to the new, lower max speed division. What's unusual is that it's already being done prior to the change approval. My scores attest to that. But it ain't no big deal to me, just a curiosity. As I entered my first tournament last year at age 54, this rule change is relevant to me. Though because I never competed before, I do not understand the change, having no history of what things were like before. Can someone please explain? 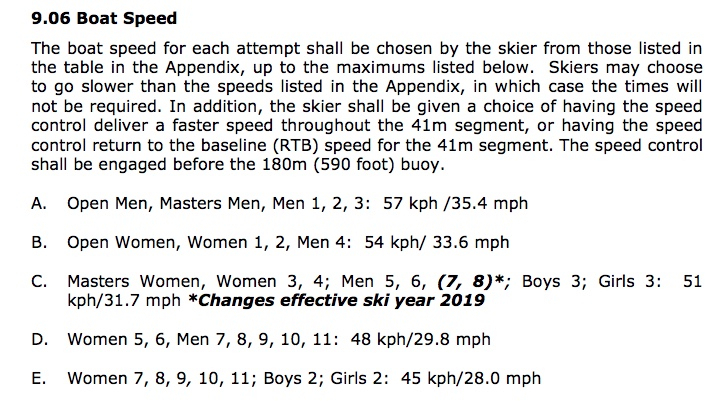 I thought my max speed last year was 34, and that the point of the rule change is to align with IWWF, and to allow women to continue to ski at 34 longer. I have no idea what the prior age cutoffs were. Can someone please help me with some history regarding the change and what the age max speeds are? Not thinking it is a huge deal for me, but just would like to understand. I do hope to still enter a tournament this year if my schedule allows. Also, I am still confused as to at what age the speeds change. @skier2788 is correct. You're looking in the jump section of the rule book. You will have a max slalom speed of 34 mph (55k) until you are 65, M7. At that time the max speed will go to 32 mph (52k). Look at the rule book again section 3.02(a) and 10.06(b). This will clear up any confusion. As for you personally, I see that you are skiing 2018 as 55 years old. Your next tournament will be after Nationals and be ski year 2109 in which you will ski as 56. There will be no impact on you as relates to the change in age for M5. You'll be M5 until ski year 2023, and you'll still be skiing at 34 in M6.